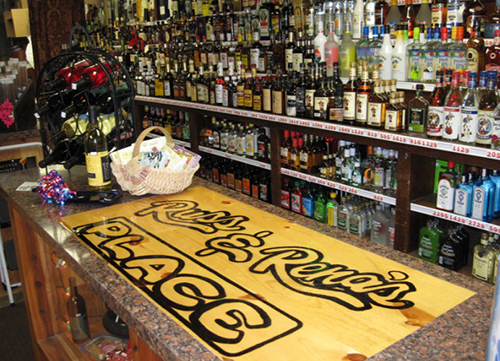 Much more than your run-of-the-mill liquor store, Russ & Rena’s Place, Inc. carries a wide variety of local Missouri-made wines, import and domestic craft beers, and a huge selection of spirits, spanning the gamut of options. From a high-end bottle of wine to your favorite domestic beer, you’ll find the perfect drink on our shelves. Stop in today! The next time you’re looking to kick back with a brew, pour a glass of your favorite drink or toast a bottle of wine with a friend, stop by Russ & Rena’s Place Inc. We’ve got the largest selection of beer, wine and liquor in the area, with options that are perfect for any tastes or occasion. We don’t just stock the samples like every other liquor store in Rolla, MO—we bring you new and exciting options from around the state, the country and the world! Stop in for a bottle of small batch bourbon, wine that’s straight from a local vineyard or craft beer that’s made by one of the country’s amazing up-and-coming breweries. Our selection of wine and spirits in Rolla, MO is second to none in the area, and we take pride in always growing and evolving it. We bring in microbrews from around the country, liquor from around the world and wines that were made and bottled right here in Missouri. Plus, we’re familiar with every product on our shelves, meaning we can make recommendations and help you find what you’re looking for, no matter your preferences. With fast, friendly service, you’ll never need to look anywhere else for beer, wine and liquor! Stop in and visit us today. We’ve been satisfying the beer, wine and liquor needs of customers in our area since 1941! Our inventory stocks the largest selection of craft beer in the area, along with the most diverse range of imported beers in the middle of the state. We strive to stock hard-to-find and high-quality products, in addition to general favorites. Come to us for high-end wines and champagnes, as well as small batch bourbons. Our staff is knowledgeable about everything on our shelves and can help you find exactly what you’re looking for quickly. We’ve got some of the best prices in the area, to ensure you’re getting the spirits you want, without emptying your wallet. When you’re looking for a 6-pack, bottle of bubbly or something to sip at home, make Russ & Rena’s Place Inc. your first destination. We’re guaranteed to stock whatever you’re looking for!